Packaging solutions provider Coveris has invested in a new 3D print technology for its Centre for Development & Innovation (CDI), based in County Durham, UK. The investment in latest 3D print technology by the Coveris Rigid Division was intended to further strengthen and streamline the design and development process from concept to final product. Coveris purchased the 3D printing system to print precise rapid prototypes of rigid packaging design proposals. The new system can also produce single mock-ups of design concepts. Coveris product design manager Carl Petrie said: “The ability to quickly create accurate 3D prints of creative design concepts allows pack dimensions, ergonomics and visual aesthetics to be evaluated and adjusted early on in a project. 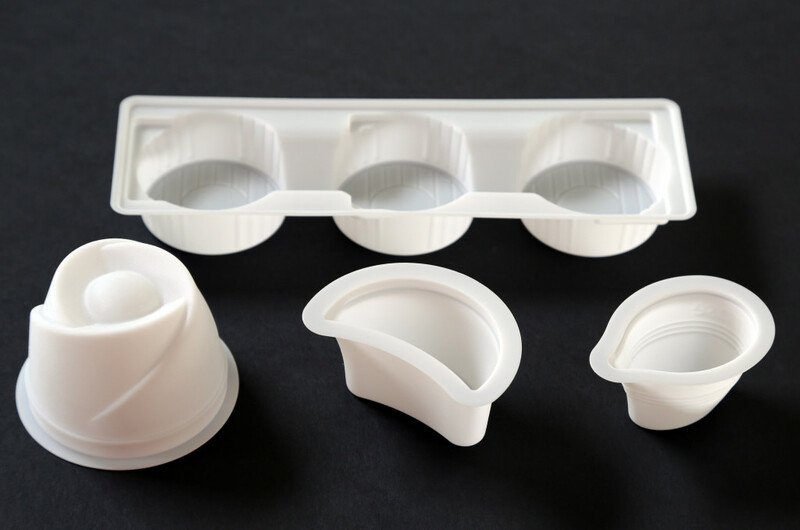 The system is also capable of printing accurate prototype moulds, from which multiple thermoformed samples can be produced using product specific raw materials such as polyethylene terephthalate (rPET) or polypropylene (PP). Additionally, the products which will be created by the 3D printing system can be tested on filling lines and presented to retailers. Coveris said that the system provides a one-stop point for creative idea generation, photorealistic rendering, rapid prototyping, sample development and production tooling. With more than 8,500 global employees, Coveris mainly serves the European markets. It has 21 factories in 14 countries worldwide. Image: Products produced with 3D printing technology. Photo: courtesy of Coveris.